Jamie Dimon, chairman and CEO of JP Morgan, alongside James Gorman, chairman and CEO of Morgan Stanley, and other bank CEOs are sworn in before a House Financial Services Committee hearing on "Holding Megabanks Accountable: A Review of Global Systemically Important Banks 10 Years After the Financial Crisis" on Capitol Hill in Washington, U.S., April 10, 2019. 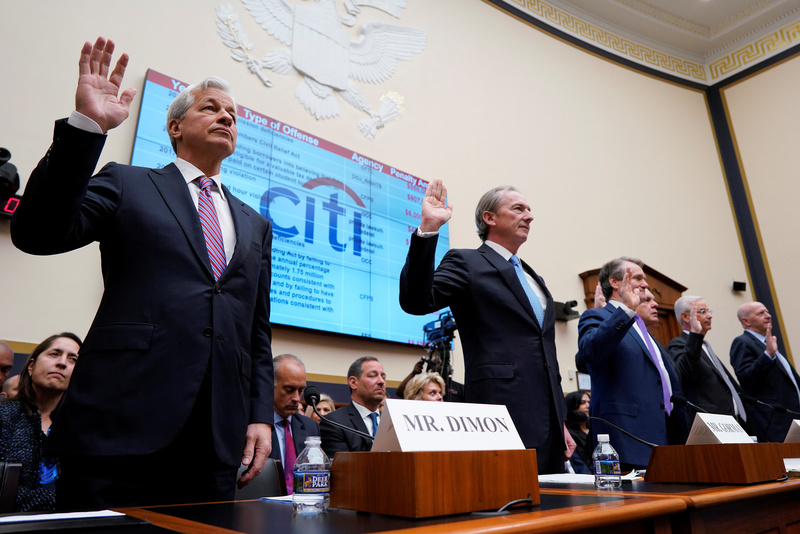 The chief executives of seven large U.S. financial institutions on April 10 appeared before a U.S. congressional panel on the subject of “holding megabanks accountable”, the first such hearing since the financial crisis of 2008. The House Committee on Financial Services heard testimony from Citigroup’s Mike Corbat, JPMorgan’s Jamie Dimon, Morgan Stanley’s James Gorman, Bank of America’s Brian Moynihan, State Street’s Ronald O’Hanley, Bank of New York Mellon’s Charles Scharf, and Goldman Sachs’ David Solomon. Wells Fargo CEO Tim Sloan appeared before the committee on March 12. Just over two weeks later he resigned.